While living in Manhattan luxury apartments, it’s often easy to forget that you are in the vicinity of one of the most famous buildings in the world. In fact, there are so many unexpected and interesting facts about the Empire State Building that it’s easy to overlook them and it’s difficult to keep track of them all. As an example, did you know that when the upper tower was originally designed, it was actually put there as a mooring mast for airships? While this may seem unusual in this day and age, air dirigibles were all the rage during the time of the construction of this building, so it made sense to offer a gangplank as a way for passengers to disembark the airship and make their way into Manhattan. This first surprising fact is a bonus. We’re also going to tell you about five other unexpected facts that you probably didn’t know about the most famous building in the world. So if you’re looking to learn more information about the Empire State Building, we recommend sticking around and reading the rest of this article to learn the truth. This may seem impossible today, but believe it or not, the stock market crash of 1929 made the beginning days of the Empire State building very difficult, and the building was off to a rocky start. Remember, the stock market crash in ‘29 was only the beginning. It set off the Great Depression, which was the worst economic downturn in the history of the US that lasted for an entire decade. When the building opened in 1931, less than 25% of the offices were occupied. In fact, another little-known or remembered fact is that this building was actually nicknamed the “Empty State Building” because so few tenants were paying rent or using the offices and other forms of retail space. For most of the 1930s, the upper half of this building was basically vacant in its entirety. The building owners wanted to create the illusion of the building being filled, so they would have their workers go through the upper floors and turn on the lights to make it seem like people were working in there. Once World War II came into being, the building finally started to turn a profit. Yes, this is something you don’t hear about too often today since it happened nearly 75 years ago. But when a B-25 Bomber was flying toward LaGuardia Airport in New York, the pilot was disoriented by heavy fog in the area and began to drift over Midtown Manhattan. 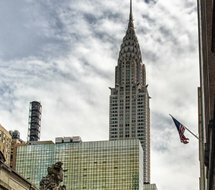 Although the veteran pilot was capable of dodging a number of other skyscrapers, he couldn’t avoid the Empire State Building and ended up crashing into the building between the 78th and 79th floor at 200 miles an hour. During the crash, a massive explosion was also triggered and debris from the building was sent crashing into the interior of the building. The pilot and two of his crewmen were killed along with 11 people located in the building. The crash also created a four alarm fire on a few of the floors. At the time, the Empire State Building was the tallest building in New York history, yet the brave firefighters in the city managed to put out the blaze in a mere 40 minutes. And two days later, the undamaged parts of the building were open for business once again. The history books often fail to mention that in the late 1920s, there was an economic boom in New York prior to the Great Depression. During this time of economic prosperity, builders were racing one another to create the tallest skyscraper in the world. The competition was fierce and in the running were the Chrysler Building and the Bank of Manhattan Building, but ultimately New York Governor Al Smith and John J Raskob announced their plans for the Empire State Building, which at the time became the tallest building in the world and held the title for 40 years until the World Trade Center was built. Even though it may seem unlikely, this colossal building went from the design, planning, and construction stages to being completely finished within a mere 20 months. Yes, it took less than two years to come up with the concept for the Empire State Building to actually having the building exist on Fifth Avenue in Manhattan. In fact, the entire project was complete briskly in 410 days. On the project, they had 3400 men working on the building every day, and they worked at a record pace that lasted throughout the entire project. During construction, at least five workers were killed but they did finish the building ahead of schedule. Although it was ultimately squashed, architects wanted to add 11 more floors to the Empire State building briefly after the World Trade Center was erected. They considered doing this to maintain the title as the tallest building in the world, but cost concerns and other complaints were the reason why this idea never came to fruition.